On Dec 14th get a group of friends together. Visit this website and watch live stream as I talk to the world from the tree tops. You can even send in comments and questions for me! As well as hear from guest speakers live streaming from around the world. Sign the virtual guest book! 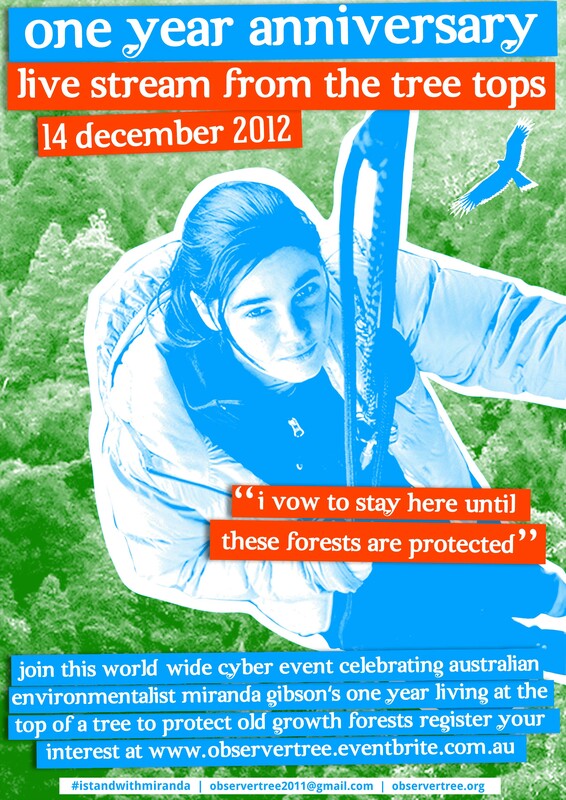 Post your comments, pictures, and videos – Tell the world why you want to see forests protected. Our livestream will be integrated with facebook and twitter, so you can use your social networks to spread the word. You can join in as an individual, with a group of friends, or host your own public event. Let us know what you’re planning when you register and if your event is public, we’ll promote it for you! Hobart- Hellenic Hall, North Hobart from 6pm onwards. Guest speakers, live music, food and drinks. Melbourne – State Library Steps from 6pm. Download the image and spread it through your networks. Posted on November 21, 2012, in Events. Bookmark the permalink. 2 Comments. You are inspiring! deciding to stand up against the power of the mighty ambitious corporations that bully and mal-influence governments around the world into policy making in their favour, it is just brave, but it is a give to the generations to come after us. The human kind, should be guarding the Earth, not destroying it…. because we would destroy ourselves eventually!